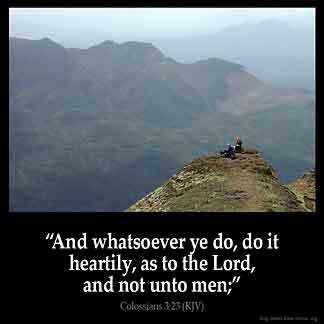 COLOSSIANS 3:23 KJV "And whatsoeuer yee doe, doe it heartily, as to the Lord, and not vnto men:"
21Fathers, prouoke not your children to anger, lest they be discouraged. 22Seruants, obey in all things your masters according to the flesh: not with eye seruice as men pleasers, but in singlenesse of heart, fearing God: 23And whatsoeuer yee doe, doe it heartily, as to the Lord, and not vnto men: 24Knowing, that of the Lord yee shall receiue the reward of the inheritance: for ye serue the Lord Christ. 25But he that doeth wrong, shall receiue for the wrong which hee hath done: and there is no respect of persons.